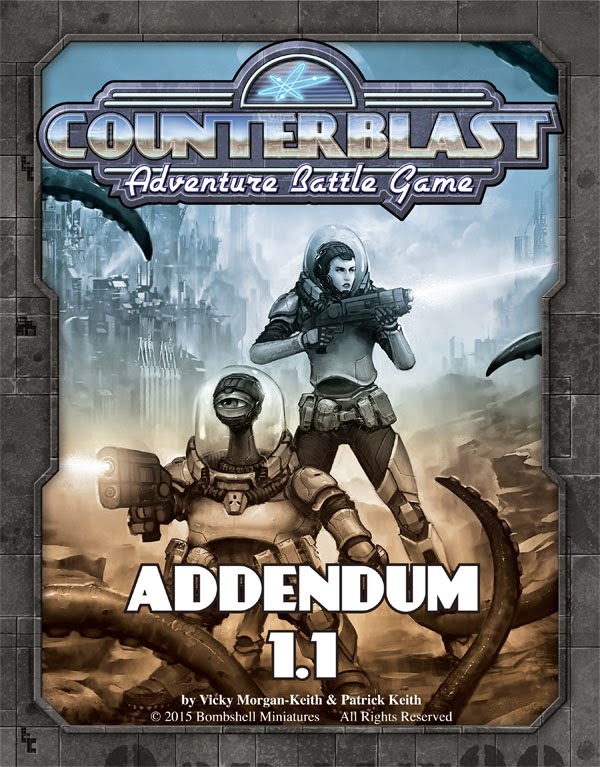 We have been working at length to get the first Addendum compiled with the errata and clarifications for COUNTERBLAST since its release last August, but it has been slow going. To let you all know, It’s just the two of us, Vicky and I, currently working on all of the Bombshell stuff. I am also still sculpting for clients, fully booked, to make ends meet. Unfortunately Bombshell is not yet a vast game company with big budgets for projects and full-time staff to develop our products. This makes it very challenging to work on new releases and rules updates, but they are coming along. We want to address the posts in the Facbook Group as well as all of the questions from the Forums to make sure the little engine Brett built runs as smoothly as possible. So, Vicky has been going through the rules and crew lists with a fine-toothed comb to make sure as much stuff is corrected and clarified to make the game as playable and as fun as possible. We are making plans right now to release COUNTERBLAST models in 15mm later this year and as such should not impact what we have in store for the 30mm stuff. In other words, we are not planning to replace 30mm releases with 15mm, but we want to expand on them. There will also be a mention of 15mm gaming in the upcoming FREE CB Addendum PDF. Vicky is very near completion of the Addendum rules and text, all we need to do is some editing and put it in a container for you to download. We expect to have this available by the end of February. Later this year Bombshell Miniatures is planning to release Mission Directive 1 which will be a supplement with additional rules, pre-built characters, and new missions. These will be optional things you can add to your Adventure Battles bringing more actions, weapons, gear, hazards, and excitement to the game. So, thanks for your patience and encouragement! It is so much fun to see how you are all enjoying the models and posting your terrific paint jobs and conversions. It is a great inspiration for us here at Bomb Squad Central to see everyone’s enthusiasm for our work.